Your goals for your family and your property should dictate the type of harvest implemented in your woods. All harvests do not provide the same benefits. Choosing an objective will help determine the type of trees that get harvested and in what numbers, in order to help you achieve your immediate goals. The trees that remain will profoundly influence the composition and ecology of your woods and therefore what benefits your woods will provide in the future. Objectives vary between landowners and can include things such as wildlife habitat, income, forest health, and recreation. Of course, many landowners have multiple objectives. You will be faced with the outcome of the harvest for years to come, make sure you are getting what you want. We encourage you to speak with your local state service forester and to work with a licensed forester in order to make an informed decision regarding the differences between objectives and the their likely impacts. There is more to a harvest than deciding what to cut. There are different ways that timber can be sold. How you sell your timber is an important factor in what money you receive. Selling timber is discussed in “Important considerations when selling timber” on the next page. 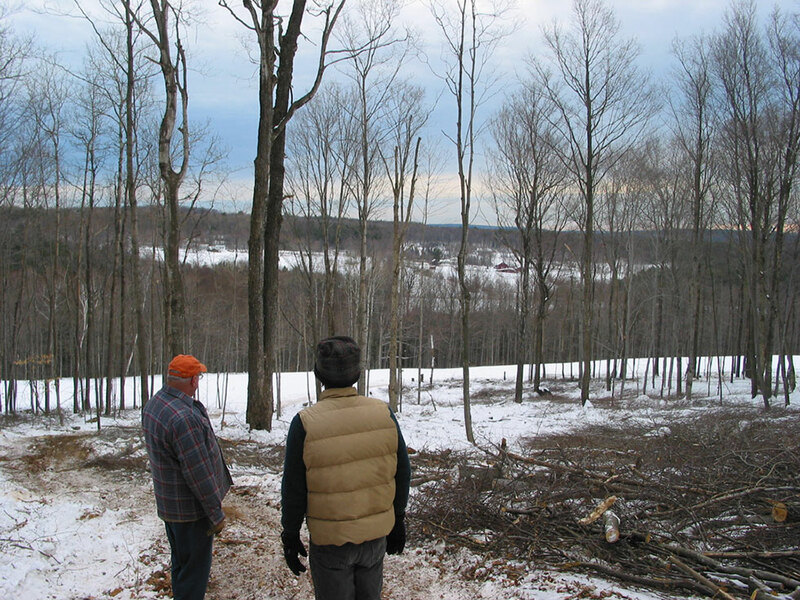 Most harvests require filing a Forest Cutting Plan with the state Department of Conservation and Recreation. A state service forester will then review the plan in the woods to make sure it meets the minimum state requirements. As a part of filing the Forest Cutting Plan, you will be asked to choose your harvest objective. Be sure that you understand the objectives and that the plan accurately reflects your goals.State service foresters are also responsible for providing free education and technical assistance to landowners. If you have any questions, contact your local service forester. Click here for next step > "Important consideration when Selling Timber"